Frank Dietz. Photo by and copyright © Andrew I. Porter. By Andrew Porter: The death of Franklyn M. Dietz, Jr., — Frank to his many friends — was announced on Facebook on October 22. Dietz, who lived at the end of his life in Marietta, Georgia, participated in many of the major activities of mid-20th century SF fandom. With David A. Kyle and his then wife Belle, in late 1956 he founded the Lunarians, aka the New York Science Fiction Society, which in turn launched Lunacon, a convention that continues to this day. For years, Lunarians met in his Bronx apartment at 1750 Walton Avenue, moving with him and his second wife, Ann — Belle had died — to Oradell, NJ, as the neighborhood around them decayed. He was chairman of the first 14 Lunacons, and was Fan Guest of Honor at the 2007 Lunacon. His activities as “Station Luna,” an effort to record the proceedings of many World SF Conventions, continued for many years. He recorded events at the 1951 Worldcon in New Orleans. It was there that a loud party in his room was moved to a larger venue: the now legendary Room 770, and the name of a Hugo-winning newszine. He was one of the organizers of the Guild of Science Fiction Recordists, and of the International Science Fiction Correspondence Club in 1949, which promoted correspondence among fans in different countries. 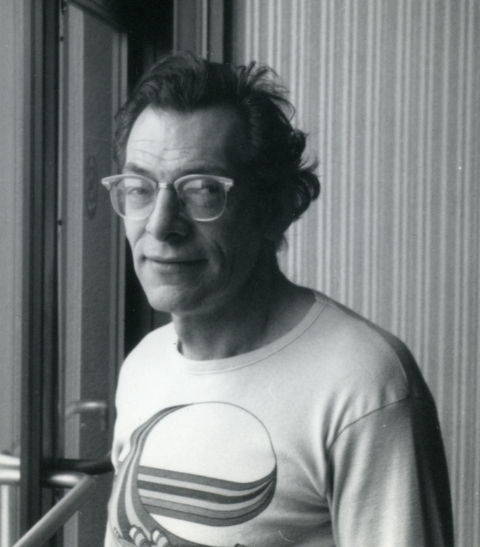 Frank recorded events on tape at many other conventions, continuing at least until the 1967 Worldcon in New York City. He possessed an original tattoo of a mouse on his upper arm, done especially for him by Hannes Bok. Photos of Frank and Belle, and many other legendary figures in SF, at Loncon, are here. 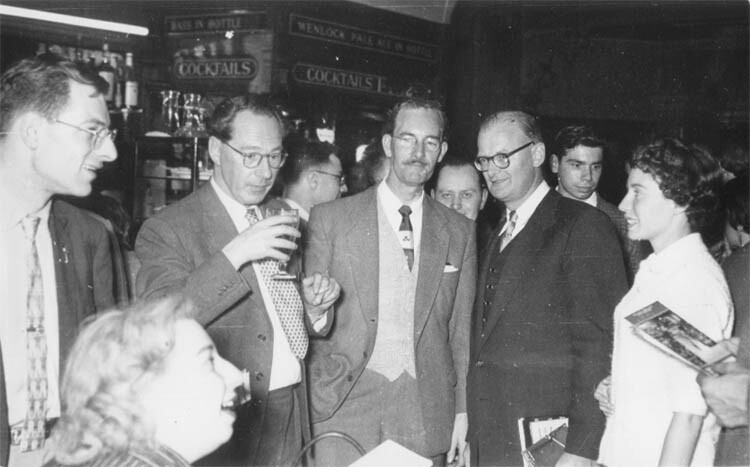 1957 Worldcon in London: (Seated at left) Belle Dietz. (Standing) Frank Dietz, John Wyndham, Sam Moskowitz (in background), Ted Carnell, Arthur C. Clarke, Bob Silverberg, Barbara Silverberg. He was involved in a notorious legal battle, with suits and countersuits, over the incorporation of the World SF Society, Inc., which had its genesis in the 1956 Worldcon, and ended at the 1958 Worldcon with a whimper and the bang of Anna Sinclair Moffat’s gavel at that worldcon’s Business Meeting. Among the fanzines he published or co-published, with Belle and later with his second wife, Ann, was Science, Fantasy and Science Fiction, starting in April 1948, Ground Zero, from March 1958 to February 1960 and Luna Monthly. He and Ann also published books as Luna Publications, including Speaking of Science Fiction, a collection of interviews by Paul Walker. They also did typesetting for other publications, including for my own Algol (later Starship), Science Fiction Chronicle, and various of my Algol Press titles, including The Book of Ellison. I wrote, then, “Thirty years ago this month.” Now, it’s fifty-three years ago. And I’m finally saying farewell to Frank Dietz. Update 10/24/2013: Corrected year of NOLAcon I to 1951 per comment.